/ Bristle Sash Brush, Pointed, 1-1/4"
Bristle Sash Brush, Pointed, 1-1/4"
A great addition to your brush collection! 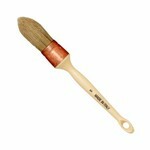 The thick bristle works well for paint or wax and carries a large load of either. The handle is designed to reduce fatigue and the fine point works well for detail. A quality yet economical tool for paint or wax.